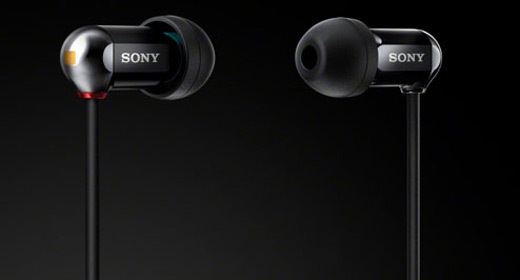 SONY’S XBA-1 MODEL is the entry point to the XBA range of Balanced Armature Driver (BAD) in-ear earphones. It uses a single full range, Japanese made BAD to cover the entire frequency range, where the other pure-audio versions use multiple drivers. Most of the information about Sony’s new BAD ‘phones has already been covered in my review of the flagship XBA-4 model (reviewed here). Details of the drivers themselves and comparisons between BADs and conventional dynamic drivers can also be found there. Like their more upmarket cousins, the XBA-1s are nicely put together and are very solid. Their slim silver and gunmetal grey housing is double layered, with internal liquid crystal polymer and ABS plastic external sections. 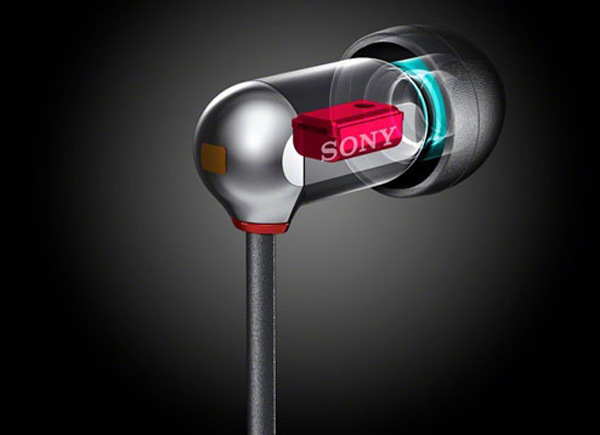 The compact size of the single driver has allowed Sony to make the XBA-1 housings much smaller than the four-driver model, which is always a good thing from a comfort and fit perspective. On the other hand, forcing a single BAD to cover the lowest of lows as well as the highest of highs may be asking a bit much, seeing as BADs don’t offer as wide a frequency range as dynamic drivers. These ‘phones ship with four pairs of differently sized silicone eartips and three noise cancelling ones, which have a layer of foam inside to reduce noise transmission. The flat cable has a ninety-degree connector and is 1.2m long, which is a useful length. The ‘phones are supplied with a cable winder and a soft carry bag. The sound of the XBA-1 ‘phones can more or less be extrapolated from this graph, albeit without the drop at both ends sounding as drastic as it looks here. 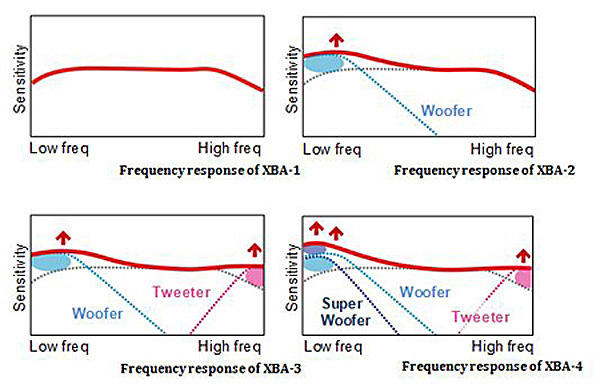 As can be seen above, the XBA-2, XBA-3 and XBA-4 models use multiple drivers to fill out one or both sides of the frequency range, with the full range BAD doing all of the work in between. As mentioned, the XBA-1’s only have that full range driver on duty, so they sound much like the XBA-4s, just leaner and cooler, with less bottom end extension and treble energy on hand. A direct comparison with the $399 XBA-4s isn’t close to being fair to the $99 XBA-1s but is inevitable to a degree. Sometimes, it can sound as if you’re listening to the same ‘phones but when a bass heavy track comes on, the two missing woofers – along with their associated huge bass presence – are noticeably absent. Still, extended listening to music from the likes of Big Boi, Eminem, Massive Attack and Wyclef Jean showed that there’s a fair amount of bass weight on hand here, enough to do the job but not enough to make you feel like your head is inside a kick drum (some people like that sensation). The XBA-1s are quite dynamic and convey impact with aplomb as long as they’ve got some volume behind them, but there are any number of equivalently priced dynamic driver ‘phones out there that have more punch at the bottom if slam and power is what you crave. The XBA-1s have other strengths though and do extremely well when it comes to subtle touches such as presentation of detail, instrument separation and overall clarity. Well recorded, heavily nuanced or textured music is a pleasure to listen to on these ‘phones. Both treble extension and the quality of the highs are good, with nary a trace of sibilance, which ties in well with the smooth yet open and revealing midrange. They aren’t rolled off at the top but don’t reach hopefully for the ultrasonic range like the XBA-4s, striking a nice balance. Some listeners may well prefer the more subdued top end on offer here though, which is ever so slightly kinder to bad recordings, not to mention modern pop or rap. The sound characteristics suit a variety of musical genres – cue up ‘Smiley Faces’ from Gnarls Barkley’s St. Elsewhere CD and the XBA-1s show off Cee Lo Green’s distinctive voice beautifully, laying it bare in all its glory along with the instruments, effects and backing vocals. Yet the track doesn’t sound overly harsh despite the recording’s edgy nature. Switch to a vastly different and much mellower recording such as Rusty Truck’s ‘1000 Kisses’ from Luck’s Changing Lanes, and the XBA-1s present the vocals in smooth harmony while preserving the rich acoustic space and most of the recording’s warm nature. Even the massive bass on Smashing Pumpkins’ ‘Stand Inside Your Love’ from Rotten Apples sounds decent enough and the song’s energy and power shines through, but this is the kind of music that could use some more grunt at the low end and I pushed the volume up dramatically to compensate. This isn’t a big failing for the Sony’s, but if you’re a headbanger, then you might want to sacrifice some of the openness for bass weight and look at dynamic ‘phones instead. Sony’s XBA-1 ‘phones make the most of a single BAD module to offer an excellent balance between price and performance. Their detail levels make some other $100-$200 ‘phones I’ve heard lately sound a little closed off, and the XBA-1s are not unlike like a budget all-access pass to your music. You also get an involving and smooth sound that’s not as clinical as the XBA-4s but it is a tad lean compared to some ‘phones that have a much warmer character.